Future applications might include robots that can interact with their surroundings with a much softer touch, even performing surgery. 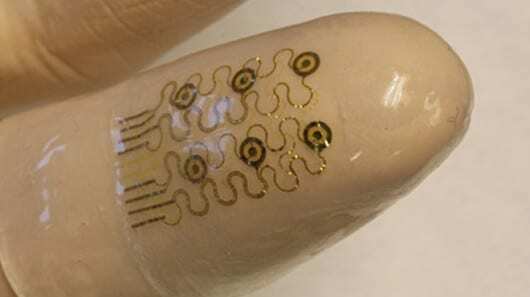 Using industry-standard manufacturing technology, researchers have integrated ultrathin and stretchable silicon-based electronics, sensors and actuators on an artificial skin that can be worn on the tip of your fingers. The result is an artificial finger cuff that could be used to produce the ultimate hi-tech surgeon’s glove, capable of sensing the electrical properties of tissue, removing tissue precisely using local ablation, or even performing ultrasound imaging with a simple touch. Electrotactile stimulation is a technology allowing information to be detected by a sensor and then presented to the skin as an artificial sensation of touch. This is usually done via a specific vibrational pattern or tingling sensation generated by a small electrical current. The technology was first explored in the fifties to develop programmable Braille readers and is now finding new applications – even helping the visually impaired to“see” with their tongue.